The chronology of stone circles. The classification of stone circles. The purpose of stone circles. The geometry of stone circles. 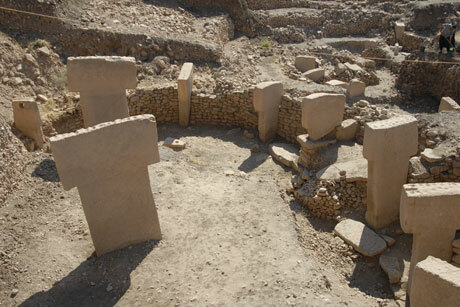 9,000 BC Gobekli Tepe, Turkey. The oldest known megalithic temple/circle in the world. 4,500 BC Nabta, Egypt. 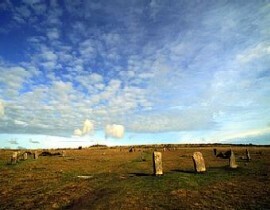 Oldest known stone circle. Placed on the Tropic of Cancer. 4,000 BC Cromleque dos Almendres, Portugal. Twin circles. Possibly the oldest in Europe. 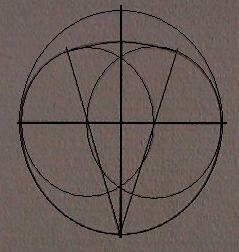 The very fact that so many of these categories are determined by the shape of the 'circle', and that circles are classified according to their shape confirms the suspicions of Prof. Alexander Thom, who first proposed the existence of a 'megalithic yard' and thereby, that there is an underlying geometry that determined the shape of many of the more significant European stone-circles. 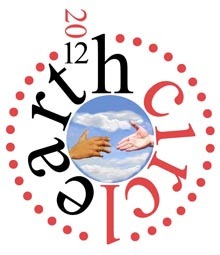 Stone-circle development occurred around the ancient world for thousands of years, and there are several different types of circle, with several showing changes in use and design over time. Many stone circles have been shown to have strong associations with both geometry and astronomy, and in several examples, the specific location of the circle can be shown to have been more important than the availability of stone. Even more remarkable than the stones themselves is our ignorance over their original purpose. 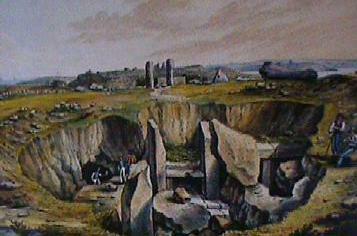 Geoffrey of Monmouth, in 1135 wrote that the builders of Stonehenge originated in the 'remotest confines of Africa' and that the stones were 'transported by giants', while Fergusson attempted to tackle the subject in 1880, concluding that they were originally constructed as 'holding pens', 'meeting places', or 'memorials of great battles'. 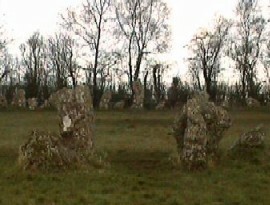 The evolution of the stone circle reveals much about their probable purposes. It has long been suspected that henges were designed in order to create an artificial horizon line, and in Scotland, recumbent circles have been shown to have had an intimate lunar association (see below). It is now reasonably accepted that most circles included astronomical orientations and alignments, and geometry, with the obvious inclusion of rituals of death (i.e. 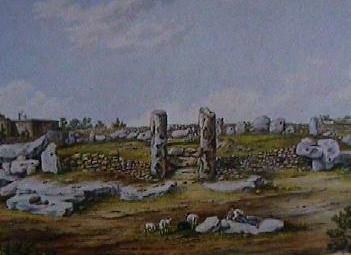 at Xaghra circle, Malta and Stonehenge, England). 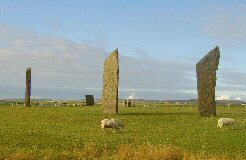 The discovery of specific astronomical purposes behind the stone circles (see below), is far removed from the earlier ideas of Fergusson (although we are still a long way from understanding them). Excavations under the Xaghra stone circle on Gozo, Malta have revealed the presence of a second Hypogeum, which was built from huge slabs of stone and has so far revealed the presence of over 70 bodies. 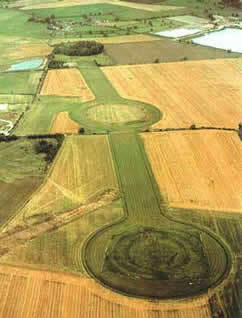 Although it is not possible to say that all stone circles were built with an astronomical consideration... It is clear that many share an intimate association with both astronomy and landscape. A connection to both lunar and solar observations has been recognised in the design of several prominent stone-circles such as Callanish, Stonehenge, Almendres, Newgrange and the numerous RSC's (recumbent stone circles) of Scotland, which are identified with lunar observation. There are only two latitudes in which the Moon's maximum declination is the same as the latitude, meaning that at its maximum elongation it goes through the zenith (directly overhead). These two latitudes are 38.33˚ N (Almendres), and 51° 10' N (Stonehenge). 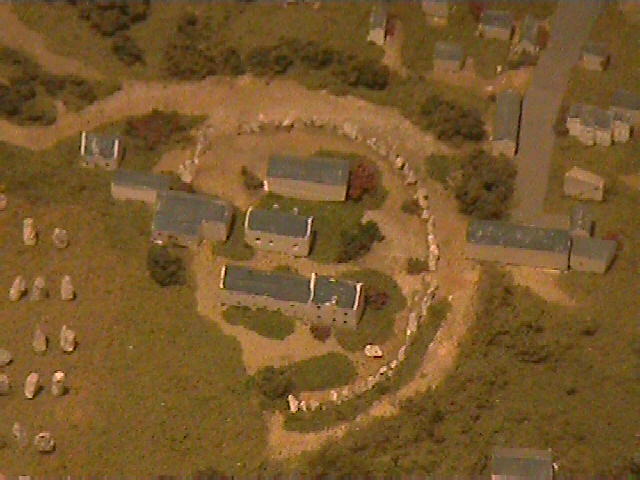 As well as being associated to Stonehenge, Almendres has a secondary lunar connection with another two significant monuments in Portugal, which are the Zambujeiro passage-mound and the 'cromeleque' da Xarez (The reconstructed 'cromeleque' da Xarez is in-fact a quadrangle). The three sites form a 50km alignment which has been suggested to be related to the spring moon (110°). The connection between stone circles and astronomy is not however, so clean-cut. A visit to almost any circle is all one needs to realise that although certain stones were selected to demonstrate a preference for orientation (with portal stones or through a gradation in height), the stones of most circles were placed evenly apart around the circumference, having a symbolic placement rather than a functional one. The choice of stone over wood added to the selection and transport of specific types of stones over long distances also demonstrates the importance of stone itself to the circle builders. Because of Nabta's proximity to the Tropic of Cancer, the noon sun is at its zenith about three weeks before and three weeks after the summer solstice, preventing upright objects from casting shadows. The Nabta stone-circle is the only megalithic construction of its kind in all Egypt. It is positioned exactly on the Tropic of Cancer. Nabtans erected several other megaliths in the area - dark stones up to 3m above the desert landscape, scattered across a square mile. Some of the megaliths formed north-south and east-west sightlines, like a giant stone compass, and probably remained visible when the summer inundation filled the Nabta basin. "We see two kinds of astronomy here — solstice alignments and cardinal alignments," says J. McKim Malville, a professor of astronomy at the University of Colorado at Boulder and a member of the team that confirmed the alignments in a paper published earlier this year. "The astronomical nature of the site was clear while we were there," says Malville. "These alignments are so simple and straightforward, there's no doubt about them." 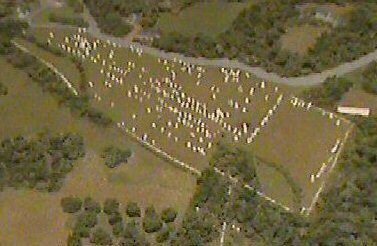 The Stone circle at Castle Rigg, Cumbria was one of the most successful that Alexander Thom came across in terms of combining astronomical sight-lines with the geometric construction of the stone circle itself. Thom himself pointed out the remarkable difficulties in trying to find a site where the skyline yielded the exact right properties to match the astronomic requirements and geometry of the circle itself. Although the geometric connections with the landscape are not immediately visible today, it has become clear that the builders were endeavouring to express, control or 'come to terms with something'. In addition, J. Glover made some interesting comments regarding Castle Rigg, namely that the specific placement of certain stones enhanced the shadow-effects caused by the sun at specific times of the year. As the circle was built onto a gentle slope, the largest stone creates a shadow nearly a half-mile long at sunset on midsummer's day. In contrast to Burl's suggestion that such geometry was purely coincidental, Prof. Alexander Thom radically suggested that geometry was deliberately em[loyed in the design of certain prehistoric sites (such as at Avebury, left). 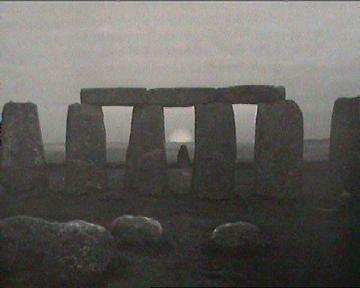 John Michell showed in the 1970's that the several stone circles of South-Western England shared a geometric relationship to each other. 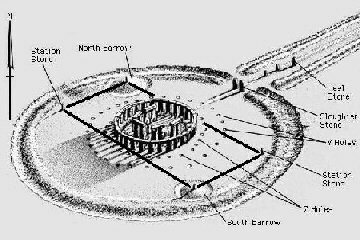 The circumference of the Stonehenge sarsen-stone-circle (100ft), is the same as that of the flattened top of Silbury hill. The same measurement is also exactly one 'quarter aurora', a standard unit of Egyptian area measurement. 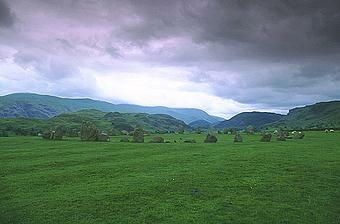 Scotland is home to hundreds of 'Recumbent' stone circles. 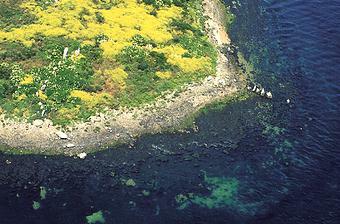 These circles are usually fairly small, the largest being (Innesmill (B5/1 at 110 ft diameter). Recumbent circles in the Grampians of Scotland have been shown to have a primary association with the observation of the extreme setting points on the lunar cycle. They are defined by a prominent 'recumbent' stone, positioned horizontally, so that the moon sets behind it at both extremes of its cycle, and upon which stones cup-marks are often found. It is an interesting fact that the only recumbent circles found outside of Scotland, are in the Ross-Carbery area of Ireland, which places them too far south to make them any use as lunar observatories, and have in fact been shown to be solar in their orientation. Cope (4), makes note of the Drombeg RSC, where the sun has been observed setting at midwinter (solstice), directly into a notch in the landscape behind the recumbent stone. Recumbent Stone Circles are one of the most definite proofs we have that Neolithic people were not only aware of the 18.6 year lunar cycle, but that they followed it closely. They demonstrate that the lunar cycle was considered an important part of the social complex in North-eastern Scotland c. 3,000 BC - 1,500 BC. The Hurlers has been suggested by astronomers to have been aligned to Orions belt at the time of building (Circa 1500 BC). 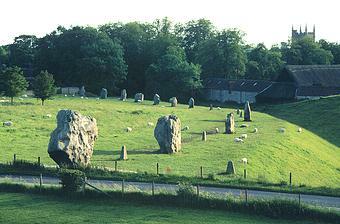 (From left to right: Clava cairns, The Pipers, The Hurlers and Avebury). 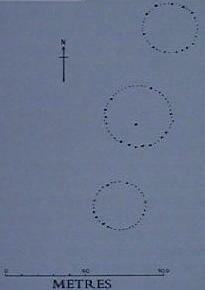 The theme of triple-aligned circles is also common to Henges, such as the Priddy circles, and Thornborough. 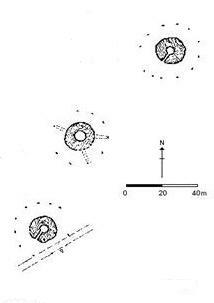 There are a handful of megalithic structures in Europe which whilst retaining an essential geometric design - are not circles. Remarkably, they also incorporate a relationship between their dimensions and the latitudes upon which they were built. Quadrangular enclosures at Stonehenge (left), and Crucuno (right). (More about Quadrangles, Geometry and Latitude). Stone circles from around the world. This stone circle is only a part of the important megalithic complex at Nabta, located on the tropic of Capricorn. A stone circle was found near Tangiers. (9). 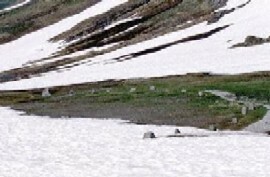 A chambered mound surrounded by a stone circle. A Stone Circle and 'talayot' towers. A Stone Circle and 'talayot'. 1). A. Burl. Rings of Stone. 1979. Book Club Assoc. 3). Burl. 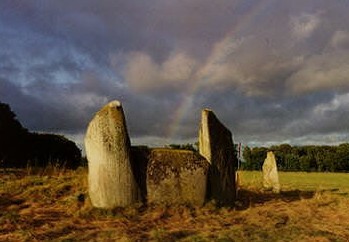 A. Prehistoric Henges. 1997. Shire publ. 4). D. Sullivan. Ley Lines: A Comprehensive Guide to Alignments. 1999. Piatkus press. 7). P. Deveraux and I. Thomson. The Ley Hunters Companion. 1979. Thames and Hudson. 8). Prof. A. Thom. The Astronomical Significance of the Crucuno Stone Rectangle. 1978. Current Anthropology. Vol 14. No 4.